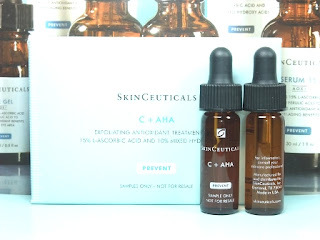 A great way to try many of the products from Skinceuticals, a prestigious brand of skincare products is with the sample packs that they offer. Skinceuticals samples are skin care products in eyedropper and spray bottles, tubes and small jars. Some contain just enough product for the customer to experience the benefits of the Skinceuticals for a short period. But if one considers the total amount of the product in the entire sample package, these samples can actually turn out to be quite a good value. One of the more popular of the Skinceuticals samples is the Skinceuticals Serum 15 AOX+. This serum is gentle enough to be used with even sensitive skin, but protects the skin against damage by free radical molecules, pollutants and the sun. In this way, it forestalls wrinkles, fine lines and dryness that come with prematurely aging skin. Packaged in an elegant white jar with a black twist on lid, the A.G.E. Interrupter also protects the skin against premature aging. It contains blueberry extract, which is now known to be a powerful anti-oxidant and other compounds that help to slow down the glycation process. Glycation is when a protein or a lipid bonds with a sugar like glucose without the support of an enzyme. This can lead to cell damage. The inclusion of substances like salicylic, glycolic and citric acids also show that the A.G.E. Interrupter is also a mild exfoliant. A new product from Skinceuticals is the AOX+ Eye Gel. This product also retards signs of aging around the eyes and treats damage to the skin around the eyes caused by the sun’s ultraviolet rays. Another product is Epidermal repair, which comes in a tube. This product was made specifically for clients who had undergone rather traumatic treatments to the skin like laser resurfacing or microdermabrasion. Compounds like beta glucan and centella asiatica soothe and heal the skin while it’s recovering from the procedures. Beta glucans, which are found naturally in shiitake mushrooms, yeast and cereals can prevent infection. Centella asiatica, also known as gotu kola, helps in wound healing and has anti-microbial and anti-inflammatory properties. Skinceuticals Hydrating B5 Masque helps to soothe dry skin. It's abundant in Hyaluronic acid and Vitamin B5. Hyaluronic acid is a sugar that the body produces naturally but produces less and less as a person ages. It not only stimulates the body to make collagen, which will make the skin more elastic, but draws water into the skin. It’s very popular as a dermal filler for this reason. Vitamin B5 is necessary for the body to metabolize fats, proteins and carbohydrates and is helpful in wound healing. This is why the Hydrating B5 Masque will leave skin feeling juicy and youthful. For those who are in the market for a gentle abrasive without the cost of going to the local spa or dermatologist's office, Skinceuticals has its Micro Polish. The professional sized tube contains a gentle exfoliant made out of aluminum oxide crystals, diatomaceous earth and botanicals. This removes the dead, dry top layer of skin to reveal the fresh, new skin beneath.